Purchase your own BLUE ROCK SCHOOL shopping bag! Made in the USA from organic, fair trade cotton, strong, roomy and perfect for all of your transport needs. Great for gifts! Proceeds help fund our Healthy Woods Initiative and the caring for our beloved campus grounds. May 2nd Vine Brigade Day - Our annual invasive vine clearing day. The children will be clipping and cleaning to help keep our campus trees and plants healthy. Parents are invited to join us. Please call the office to confirm if you will be helping. Mid-May 7/8 grades Plant and Seed Sale The students will be selling on campus after school, as well as at the Nyack Farmers’ Market, to raise money for their end-of-year class trip. The seedlings are growing strong and will be ready soon. April 14th Parent Work Day & Tree Planting – Parents gathered together to plant 8 new trees on campus and tended to the grounds-Thank you! Our students are making their voices heard regarding the importance of fighting climate change on campus, in the local community and in the world. 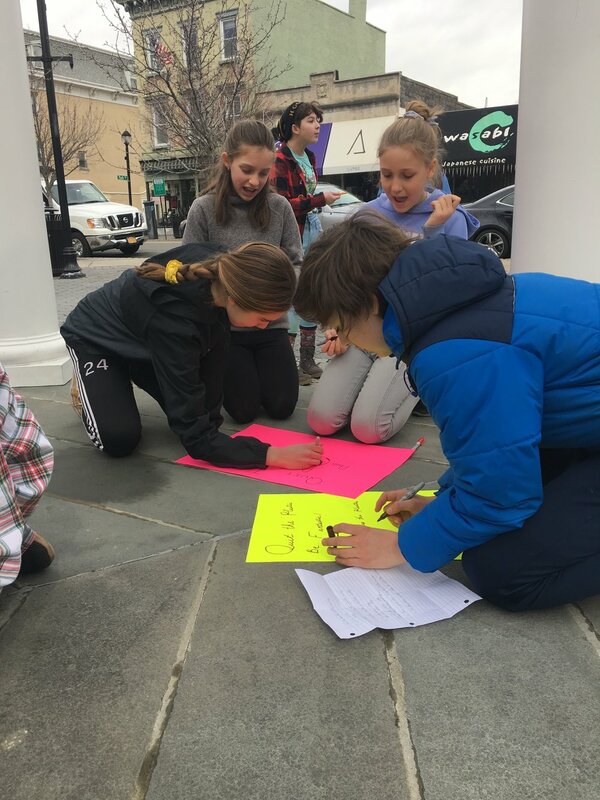 The middle school has been studying and practicing environmental sustainability and activism through monthly round-table discussions, working with local environmentalists to share ideas about caring for the earth’s resources. Students are deepening their understanding of the Hudson River Watershed, writing letters to local and state government officials, and took part in a Q&A session with the mayor of Nyack, to support Nyack Village’s environmental initiatives. For upcoming First Graders (2019-2020). All kindergarten parents are invited for an introduction about first grade at Blue Rock School. Debi will discuss the rythms and routines of first grade and will leave time for questions. 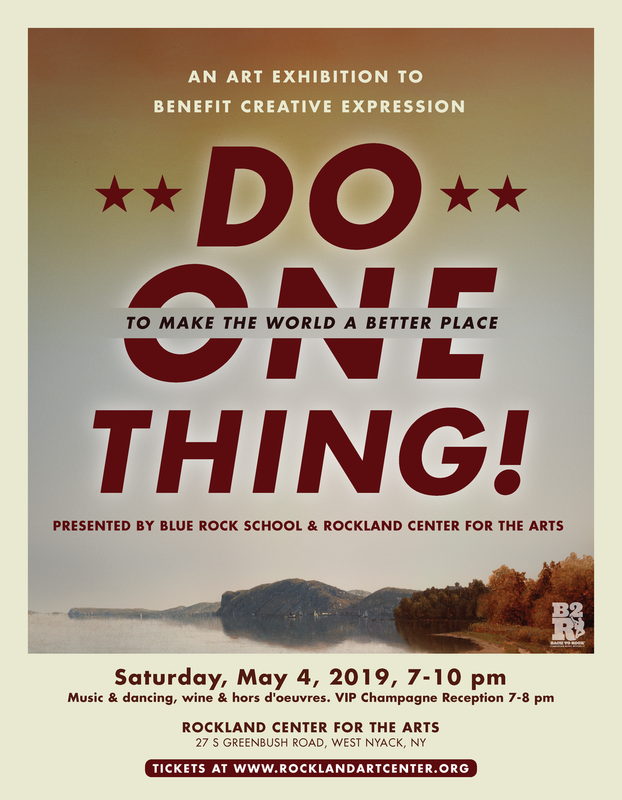 Blue Rock School, in partnership with Rockland Center for the Arts, will be presenting an art exhibition to support creative expression and social activism while benefiting the student scholarship funds at both organizations. Artistically, the goal of the show is twofold: to showcase art that touches on issues of significant importance among our community members; and highlight the important role that artists can play in amplifying a message or point of view and effecting meaningful change in the world. All this, while inspiring a new generation of artists and raising funds for two Rockland non-profits dedicated toward giving young artists a regular platform for creative expression. In addition to featuring more established artists, area high school and college-age artists are being encouraged to participate in the exhibit and have their voices heard. Tickets can be purchased in advance below at a discounted price. Children grades 4-5 and kindergartners will be performing their spring play in the multi-purpose room. They will invite the parents to share some refreshments after the performance. Looking for a refreshingly relaxed and creative approach to summer fun for your kids this summer? Consider Summer Play Camp—a charming and magical place nestled in a wooded hillside of West Nyack where adventure awaits. At Summer Play Camp, children ages 3 to 11 engage in a variety of playful and discovery-based activities each day, from swimming, art and drama to science, gardening, woodworking, cooking and more. To find out more go to our website summerplaycamp.org. Children grades 1-3 will be performing their spring play in the multi-purpose room. Parents will gather on the school grounds to help with gardening and other necessary projects, and enjoy each other’s company around a delicious and varied potluck lunch. 5th-8th graders will be performing their Spring Concert in the multi-purpose room. Children and parents will share some refreshments after the performance. Kindergarten Day is the final step in our admissions process. Applicants will be invited to join us for a 2-hour program of fun activities with the kindergarten staff. The recent parent workshop was a rich and exciting evening of learning. Teachers explained some of the ways writing is taught at Blue Rock and parents had an opportunity to write and share stories, poems and impressions. 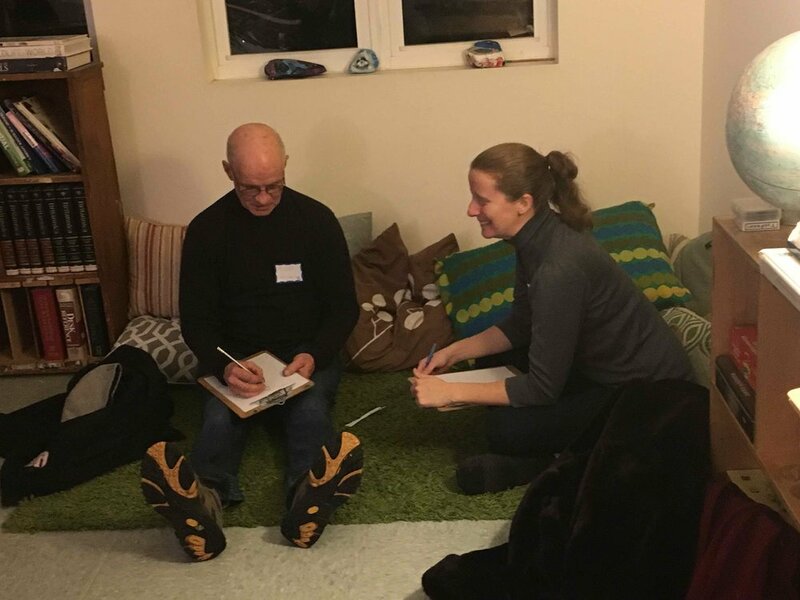 As guests arrived for the evening they began with one of two activities; either writing a descriptive poem or writing about a chosen object from a variety of points of view. The descriptive writing was based on an activity the children have done recently during science class in the 6-8th grades. Throughout their studies on the Hudson River Watershed the children have been learning new scientific vocabulary about the water cycle. These vocabulary words were used to create poems about water and how the students personally relate to the Hudson. The parents had a chance to participate in the same sort of activity. The children also study Point of View (POV) throughout the grades. For POV writing, we assembled a variety of objects on a long table--from a feather to a rubber duck to a strange music box--and parents were asked to choose an item that they were drawn to. Participants then wrote about their piece by choosing a prompt from the POV-1st, 2nd or 3rd person. They could choose to write about how the object might be loved or about the object’s feelings, history, etc. An incredible amount of creativity and delight resulted from these two activities and many parents willingly shared their poems and POV pieces with the group as a whole. Next, going out into the dark night, participants used all of their senses to soak in and experience a cold winter evening. Once back indoors parents jotted down their impressions as fuel for creating vibrant imagery with words. We then spoke about how writers describe settings to set the mood in different genres. At BRS the children are continually exposed to a variety of genres through their lunch books, snack books and individual reading. They then reflect on the writing, write book reviews, hold discussions and participate in literary analysis and book groups that further their own skills and understanding of the writer’s work as a craft. Parents worked in pairs, as the children often do, to use their impressions from outside to create a vivid setting for a story. Then they generously shared their work exploring genres from the style of the classics to steampunk and dystopian fairytales. The evening ended with teachers sharing some of the different types of writing projects students embark on and the skills we teach the children, as well as how we help them to learn the steps of writing a piece, which include goal setting, outlining, drafting, editing, presenting and constructive feedback to help the writer set new goals for their next piece of writing. A beloved and long-standing Blue Rock tradition, Blue Rock Rocks is a highly entertaining evening of performances by some of Blue Rock's most talented alumni musicians. Not to be missed! Space fills up very quickly, so please contact the Main Office at 845-627-0234 to reserve your seat and purchase tickets. Tickets are $20 in advance and $25 at the door. This is a 13-year-old and up event and there is a $10 minimum please. WE ARE CLOSE TO BEING SOLD OUT SO BUY YOUR TICKET TODAY. The children of Blue Rock School cordially invite you to join them for a Winter Solstice Celebration! Please contact the office for ticket information and reservations. Join us for a campus tour during a school-day morning. Walk through our beautiful grounds and peek into the classrooms. Get a snapshot of what a day at Blue Rock School is like. We are delighted to host Onawumi Jean Moss as she returns to Blue Rock School for two days of storytelling with our students and teachers. While here, she will also be offering a special evening workshop for parents and faculty. “Courageous Conversations” will explore ways to approach challenging and important conversations on race and injustice with this master storyteller, author, academic, activist and artist. RSVP required. Please call the Main Office at 845-627-0234. Suggested donation $10. As an African American woman who grew up during the Jim Crow South and the Civil Rights Movement, and went on to guide young people as the Associate Dean of Students at Amherst College for twenty-five years, Ms. Moss has a deep understanding of human relationships and communication. Ms. Moss’ workshops and discussions are distinguished by her unflinching honesty and humor, her encouragement to all to take on this life-long work towards deeper understanding and growth, and her appreciation of cultural differences and recognition of kinship. 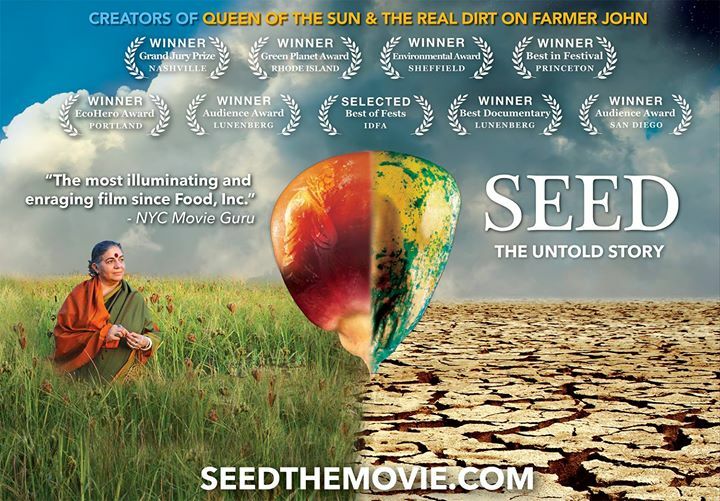 Her work inspires courageous conversation within and across social boundaries. Ms. Moss holds numerous storytelling awards including the 2005 Zora Neale Hurston Award, the highest award given by the National Association of Black Storytellers (NABS); the 2007 Brother Blue and Ruth Hill Award from the League for the Advancement of New England Storytellers, and she has recently been nominated for the National Storytelling Network’s Lifetime Achievement Award. Join us for a foot stompin' good time! Contra dancing with dance caller and live fiddle music. Refreshments and fun raffle. All ages welcome. No prior dance experience necessary. To sign up for a shift, click here and to purchase tickets, click here. .
A special day for celebrating our elders and extended family of friends. We welcome each Blue Rock family to reach out to your living "ancestors" and invite them to spend a morning at the school with the children. While here, they will be greeted with a coffee and tea reception, enjoy a student musical performance, take a guided tour of the campus, and visit their dear one's classroom. Please RSVP by contacting the Main Office at 845-627-0234 or office@bluerockschool.org.